Product information "HI981035 Foodcare Sushi pH Tester"
SHORT DESCRIPTION: The HI981035 Foodcare Sushi pH tester is an application specific designed pH tester for the measurement of pH of sushi rice as part of a Hazardous Analysis of Critical Control Points (HAACP) plan. This meter offers many advanced features including a pH electrode designed specifically for the measurement of sushi. LONG DESCRIPTION:Sushi rice needs to be kept warm (about 32 °C/90 oF) for best results when rolling sushi. However, this temperature can create food safety risks especially when the rice is held for several hours in what is considered a temperature "danger zone" for foods. In the sushi making process, pH monitoring is considered to be essential and a number of customers are required to maintain a record of hold times and pH levels. Most regulations require that sushi rice is acidified by acid such as vinegar in order to maintain a pH below 4.6. The lower pH inhibits the growth of bacteria to keep the sushi rice safe for consumption. 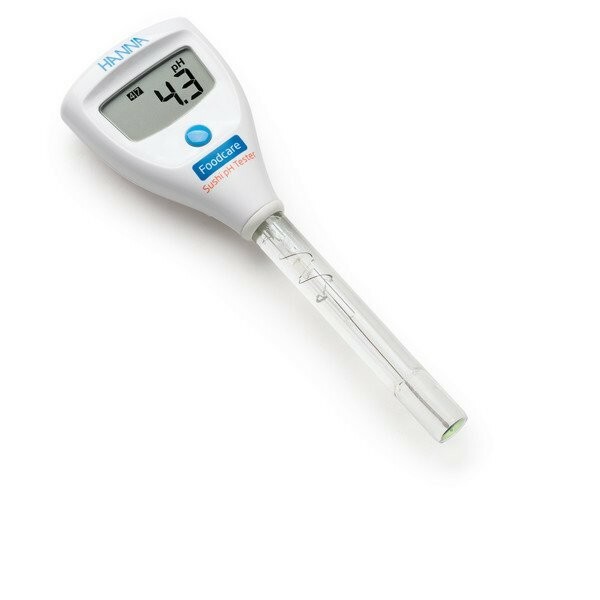 The HI981035 Foodcare Sushi pH Tester has been designed with many advanced features including a uniquely designed glass body pH electrode that has flat tip for surface measurements. The flat tip electrode coupled with an open reference junction allows for the direct contact surface measurement of pH. This is very beneficial when trying to measure the pH of sushi rice that is a solid. The sushi rice pH electrode features an open junction design. The open junction design is necessary in order to permit contact between the internal reference cell and the surface of the rice. It is this design that allows for the direct measurement of sushi rice without having to make a slurry with rice and purified water. Another benefit of the open junction design is that it is clogging resistant from solids and semisolids. The clogging of the pH electrodes junction is a serious problem that can occur when measuring pH. Every pH electrode has a reference cell as part of the measuring circuit. The reference cell has a junction, also known as a salt bridge, that isolates the inside portion of the electrode from the sample being measured. This junction must be free flowing in order to provide continuity with the sample. When the junction becomes clogged from starches from the rice the circuit is interrupted and the readings become sluggish and erratic. The HI981035 uses an open junction design in which there is not the typical ceramic material used with many pH electrodes. The open junction design is resistant to clogging leading to a longer life. There are many considerations when designing a pH electrode for a specific application. Below are features that we consider important when designing the ideal pH electrode used in the measurement of sushi rice. · Flat tip pH Electrode– A flat tip pH electrode allows for the direct measurement of solids by simply touching the surface of the product. No slurries to make with purified water. · pH Electrode with open junction – The pH electrode of this tester uses an open outer junction design. The open junction is clogging resistant due to the hard gel surface known as Viscolene that is used for the reference cell. When the junction becomes coated with starch from the rice simply clean the probe to expose the viscolene reference. · Glass Body– The glass body of the pH electrode is not porous and has no traps for food particles. The glass can be easily cleaned and reduce the risk of bacterial contaminants. The Foodcare Sushi pH Tester has many other advanced features including automatic calibration to one or two points, automatic buffer recognition, calibrated buffer tags, stability indicator, low battery indicator, and selectable automatic shut off. · Large LCD – An enhanced LCD displays the measurement reading, stability indicator, low battery indicator, and calibration tags. · Automatic Calibration - The Foodcare Sushi pH Tester is calibrated automatically to one or two points. The calibration buffers are automatically recognized and after calibration the buffer values used are shown on the display. · Stability Indicator – An hourglass indicator is displayed on the LCD until a stable reading is obtained. Once a reading stabilizes, the indicator disappears and a reading can be taken. · Automatic Shut-off – The meter can be set to automatically turn off after 8 minutes or 60 minutes to conserve battery life in the event that the meter is left on. The auto-off feature can also be disabled. · Probe Diagnostic – During calibration the meter will display error (Err) message as an indicator that the probe needs to be cleaned. · Long Battery Life: The Foodcare Sushi pH Tester has an exceptional battery life of approximately 1000 hours. When the battery power is running low, a low battery indicator is displayed. · Plastic Carrying Case – The HI98103 Foodcare Sushi pH Tester is supplied complete with meter, probe, calibration solutions, and cleaning solutions. All contents are packaged in a durable plastic carrying case. · Economical – The Foodcare Sushi pH Tester is a fully featured meter at a price that is affordable for both the hobbyist and Sushi making professional. user selectable: off, 8 or 60 min. Measurement of pH of sushi rice. HI981035 is supplied with built in Sushi pH electrode, HI70004 pH 4.01 buffer solution sachet (2), HI70007 pH 7.01 buffer solution sachet (2), HI700641 cleaning and disinfection solution for dairy products sachet (2), HI9072 storage solution (13 ml), instruction manual, instrument quality certificate, and plastic carrying case. Related links to "HI981035 Foodcare Sushi pH Tester"
Customer evaluation for "HI981035 Foodcare Sushi pH Tester"